This is the last part of my 3-part series on how to get on the Dean’s List. If you haven’t, read part 1 and part 2 first. Some students may feel bogged down by work, lamenting about the heavy workload and lack of time. Honestly speaking, it’s not about the workload nor the lack of time. It’s about how you manage yourself. Even though I participated in more things in university than I did in junior college or secondary school, I felt freer during university. I had engagements like client work for my web design business, my core curricular activities, case competition involvement, and giving private tuition to 3 separate students. Studies-wise, Business modules are project intensive. There is usually a group project and 2 individual assignment per module. Group projects often take up a lot of coordination and discussion. Some modules even have 2 group projects. Yet, I had no problem getting things done and still had time for myself. Online games were a daily staple. I was playing games like Gunbound, Ragnarok Online, Maple Story, and Warcraft 3 almost every day with my friends. I also often went out with my girlfriends. So is it really about the time? The way I see it is that all students have the same amount of time. All students of a module have the same workload, have the same teachers, and are evaluated on the same criteria. All students have their personal commitments and responsibilities. It’s about how you manage your schedule. The plus side of being a university student is that you have full flexibility and full rein over how you map out your timetable (see tip #2 on planning your modules in advance). Don’t attend classes if they don’t add value. There were several modules where I didn’t attend any lectures at all (save for the first lecture). If I didn’t see any value in the lecture, I wouldn’t attend. For example, if the lecturer spent a lot of time talking about irrelevant content or if the material taught could be extracted from the textbook, I would stop attending. Sometimes if the lecture looked like it was going nowhere, I would get out of the lecture hall and go to the computer lab to do my stuff. The time I freed up from not attending lectures was spent doing other more valuable activities to me (such as resting, doing project work, and doing assignments). Use time pockets. My bus ride to school was about 45 minutes. Multiply it by 2 and it’s about 1.5 hours. I usually used the time to read my books, study my notes or even do my assignments. Similarly when waiting for the next class to start, I would use the time to work on projects or catch up on past materials. Hence, I never had to spend much time studying during my free time. Understand the content the first time it is taught. This minimizes rework later on. See tip #5. Maximize webcast lectures. If modules have webcast lectures, I would skip the actual lectures. Webcast lectures are just as good, if not better, than the real thing. You can skip past a segment if it is irrelevant or replay sections where needed. You can also catch up on multiple lectures at one go, which is more effective. Do your tutorials during the lecture itself. Tutorial classes on a topic usually commence 1-2 weeks after the lecture is taught. By doing the tutorial assignment immediately during the lecture (of the same topic), you (1) get the most out of the lectures as you are testing your understanding of the concepts, (2) save yourself time from having to recall what you learned before, and (3) don’t have to take out time to do the tutorial assignments later on. Use study techniques to speed up learning. See tip #8 below. The normal way to study is to read the textbook from cover to cover and do questions to test your understanding. Then over time, reread to strengthen your understanding. When the exams are here, you repeat this as you revise. This method takes up a lot of time and is hardly effective. Mind maps. Mind maps were my trusted ally during my varsity years — they helped me grasp the big picture and see interlinking concepts easily. I would draw a mind map for the important or information intensive chapters. My mind map also served as a chapter index — I would list the textbook page numbers beside each concept. Pick the 80/20. 80% of the value in your textbook can be found in 20% of the content (usually the formulas, summary notes, definitions). Pick out the 20% highlight and spend your time understanding them. Read the other 80% if you need to understand something, but don’t read for the sake of reading. You don’t learn much that way. Writing notes. I only read my textbooks once. After that, I would refer to my mind maps, since I had laid out the information in a much more understandable and intuitive manner. I would refer to the textbooks only when I wanted specific details after reading my mind map. Active learning through participation. See tip #9. Association. Linking similar ideas in your mind, so that it strengthens your understanding of the new concept. I often looked for common themes across my different modules and mentally linked them together. This had a synergistic effect in my learning. Start with questions first. Read with an objective. If you start off doing questions first (whether in tutorial or in the textbook), it gives you an idea of what you should be learning. This is learning with a purpose. Photo reading is a reading technique that helps you increase reading speed and value extraction. I haven’t tried it before, but I have a friend who tried it and said that it works. Based on what I’ve read about photo reading, it sounds similar to certain things I do intuitively (over the years) to maximize my reading, so I’m not surprised to hear about its effectiveness. Learn more about photo reading here. 9. Speak up. Ask questions. In NUS Business School, participation is often a component in the module’s grades, contributing to 5-15% of the final grade. It was the professors’ way of getting the students to speak up. In my culture and generation, Asian students tend to clam up in group settings. I reckon this isn’t a problem in Western cultures. However, the reason you should speak up in class is beyond getting participation points. Speaking up is a great way to clarify your thoughts on the subject. It also lets you know whether you know your stuff or you have your concepts wrong. It gets you thinking and increases your learning from the class. In general, we learn much more and much faster when we actively participate vs. if we passively read/listen. Active learning is more powerful than passive learning. Speaking up also makes classes more fun and exciting. I can’t imagine sitting in a class and listening the whole time. That would be really boring. So speak more. Share your thoughts. Expand your mind. Ask questions. But don’t talk so much that you dominate the class. I had a classmate who had a tendency to turn the class into a dialogue session between him and the tutor. That isn’t being polite to the other students. Contribute to the class in a meaningful manner that helps all other students to learn too. Your professors are there to help you. After all, they have been teaching the subject for years and they are the ones evaluating your performance, so they are the best people to help you in your studies. If you don’t understand a concept or you need help, approach them. Whenever I had questions, I would email my professors to clarify the questions. If I had more things to discuss, I would set up consultation sessions with them. It saved me a lot of time than just trying to figure things out and not being sure whether the answer was right. It was a great way to know them on a personal level too. This applies if you have group project work in your modules. I’m not sure about other faculties, but project work is a staple in business courses. It’s important to get good teammates, because this affects the group dynamics and subsequently the output. Ever watched The Apprentice before? The kind of teammates you have directly affects your team’s results. The best team is one where the total output is more than the sum of what the individual members can achieve. A common woe among students is project work hell due to bad teammates. What determines a good teammate? Generally (1) Attitude and (2) Knowledge, where (1) is more important than (2). During my early years, I had project mates who were less than committed. They saw project work as a liability, and only did the bare minimal required. Some produced shoddy work and it made the project development process painful. Most of the time, the stronger members in the team would step in to fill in the gaps so as not to affect the final grade. While this solves the problem, it’s hardly a long-term solution. The best way is to grab good teammates you have worked with, then arrange to take the same modules and be in the same project group for the next semester. If you are a strong teammate, they would want to work with you as well. If you are a freshman, this would be hard, but it shouldn’t matter much as everyone is starting on the same ground. Always be on the lookout for the best people to form your dream project team. It doesn’t hurt to get advice from people who have taken the class before. Since you choose when you want to take a module, sometimes your peers may have taken the module before you do. This is a great chance to consult them on what to expect, what the class is like, and how you can prepare and do well in the module. If possible, get their materials and notes too. Of course in return, help them out in the other modules they are taking. As with the golden rule, treat others as you would like to be treated. As with everything in life, don’t leave things to the last minute. Getting the best grades is like running a marathon. Plan out your resources carefully and pace yourself. Just like no one finishes a marathon in 10 minutes, you shouldn’t expect to ace your exams with one day of studying IF you have never studied the materials, done a single tutorial, or attended any classes. Do your tutorials on a timely basis (see tip #6 on preparing for your tutorials), participate actively in class (tip #9), and consult your professors regularly when you have questions (Tip #10). Follow the other tips in this series. Because I was consistent in my work, when the exams came I never had to spend much time revising. Whereas my peers would be very fearful during the exam period and spend the pre-exam weeks mugging away, I continued with my usual activities of gaming, leisure, and giving private tuition (as a side income). Before my exams, I just needed to quickly review my materials, and I was ready to go. A lot of students fear the exams. To be honest, I don’t think it’s the exams they are fearing. What they really fear is what the exams represent — the moment of truth that reveals their performance in the semester. If you understood the content when they are taught, you are prepared for your tutorial classes, and you revise your stuff, there isn’t anything to fear at all. The ones who fear the exams are those who subconsciously know they have not been consistent. Be consistent with your work, and you will reap the fruits of your labor come exams and when you get your results. To all students out there, I hope you find these tips useful. Even if you are working now, you may return to school for further studies (there is never an end to learning after all). This Dean’s List series will come in handy then. 😀 Feel free to share this with your friends in school so that they can benefit from it too. 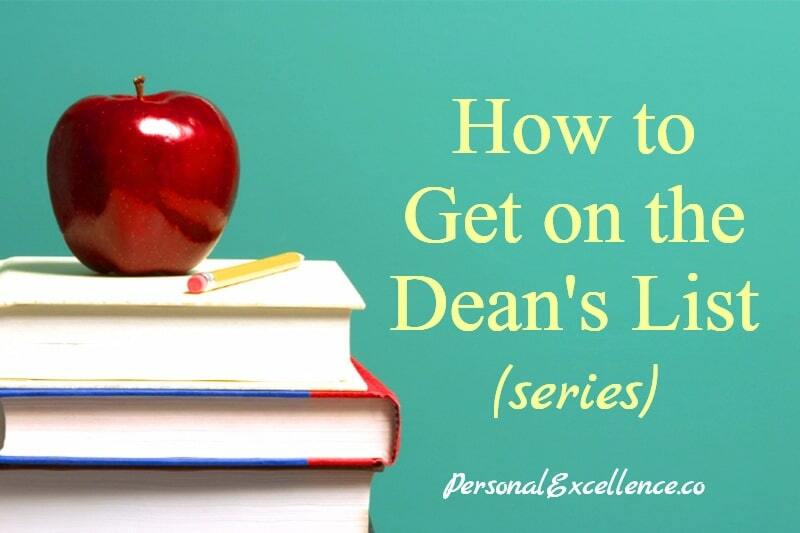 This is the last part of my 3-part series on how to get on the Dean’s List.